Are You Making Time for God? We are all busy. So much to do and so little time to do it. At the end of the day we are exhausted and ready to get some sleep so that we can get up the next morning and do it all over again. 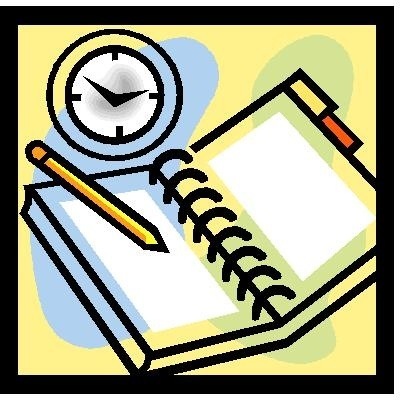 Did you make time for God? Was he left out? While laying in bed, do you now take the time to say a quick bed time prayer? How does God fit into your schedule or does he even have a spot? If you are a faithful christian and belong to a church then you likely believe in tithing and giving the first of your finances to the church. You were taught that this should be at the top of your budget. You don’t wait and give what is left over at the end; you give to God first and then everything else comes after. This tithing principle should also apply with our time for God. Are you giving God the first of your time or the last? Is God just getting the leftovers, if there are any? Put God at the top of your daily To-Do list. Spend the first part of your day with with Him in prayer and reading the Bible. Give Him the first part your day and he will give you the rest. My youngest son wrote this poem in school. As I write this I am attempting to look at it through the eyes of someone else rather than my own. If I were his teacher, reading through this poem, this is what I would have learned about his family. Dad cooks breakfast and mom cooks dinner. Mom and Dad are working together, sharing the duties of the family. This family takes road trips together. This means taking time out from the hustle and bustle of every day life to get away and spend time together. Mom is very kind and tenderhearted. She is there to help when they fall down and get wounded physically as well as emotionally. There will be fighting between siblings and even disagreements between the kids and parents, but this is normal and even needed in order to learn and grow. This family has routines, such as eating pizza on Friday’s. This gives the kids something to expect and look forward to each week. This family uses sports as a way of interacting with each other and spending time together. This family believes in prayer and going to church and they do it consistently; prayer every night and church every Wednesday and Sunday. 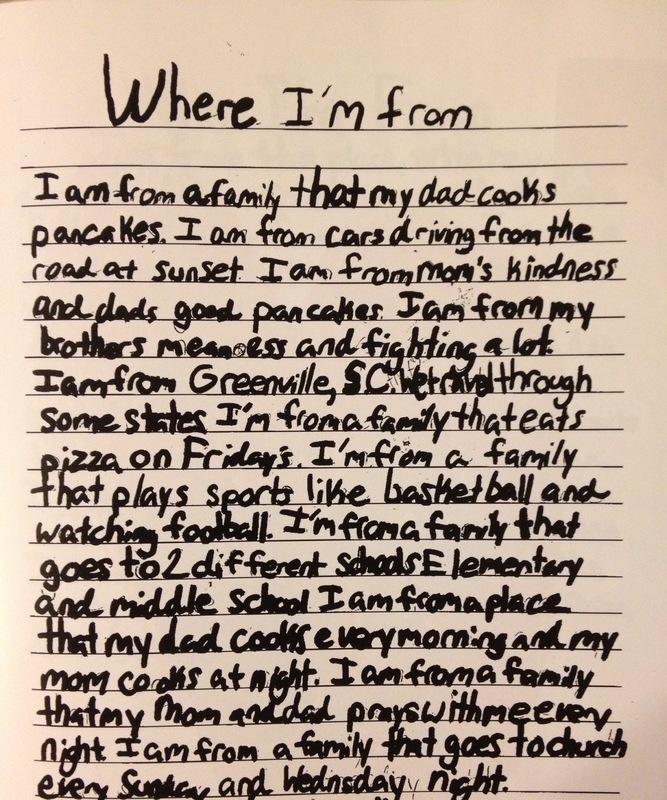 Challenge: See if you can get your child to sit down and write their own poem about “Where I am From” and see what they reveal about your family. A child speaks from the heart and can be very honest in their words. I pray that you will be touched by what they say as much as I was. God is so good to me that I couldn’t possibly cover it all, but here are some basic things that I like to thank Him for each and every day. First of all I am thankful to even know Jesus, for without Him I would be lost, without direction and just aimlessly wondering and searching for purpose and happiness. I am so blessed with the family that I have been given. My wife and kids mean everything to me. They are my reason for living other than God. I am also thankful for parents that raised me in the church and taught me the importance of loving God. I am thankful for a place to call home. A place where our family can live, eat, sleep and spend time together. I am thankful every day for the food that we have to eat. 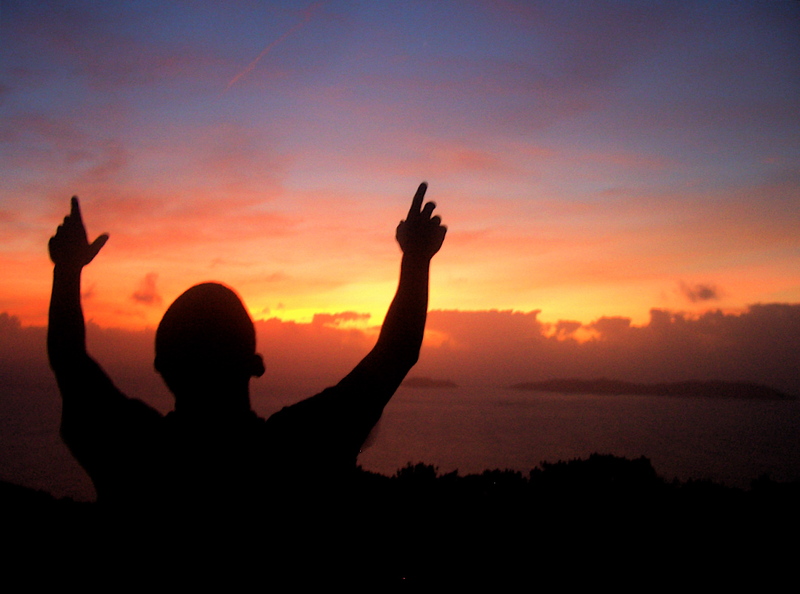 Not only do I thank God before meals, but also thank him in my daily prayer time as well. I want him to know that I do not take even the basic needs that have been provided to me for granted. I thank God every day for the cars that he has given us to drive. They get us to and from our home, jobs and the church. Every time I get in, turn the key and it starts I say “Thank You Jesus”. I thank God every day for good health. If I am not feeling well, then I thank him for just being alive. Every morning I thank God for allowing me to wake up and giving me another opportunity to serve him and hopefully reach out to someone. I thank God every day for the church that we are a part of. I thank him for a pastor that loves and cares for us and for the friends and fellowship that we have made. I thank God every day for the job that he has given me that allows me to provide for the needs of my family, the church and others. These are just some of the basics that I start my pray time off with. If you are ever struggling with what to say when you pray, start with thanking God for meeting your basic needs.